Today I’m coming to you with this precious off shoulder blue and white striped top. Where to even begin? The billowy sleeves, bright colors, and the absolute precious tie at the front all make for a piece that I know will get plenty of wear in the upcoming spring and summer months! You’re going to die when you see where I got it from… I actually had to look up and double check the site I was on, because this doesn’t seem like it’s from Forever21 at all. At $35, it’s truly a steal! Pairing the top with these white jeans and flats created the perfect effortlessly chic everyday ensemble, but pair it with espadrille wedges for a day out on the town with your girlfriends! Or add some denim shorts and sandals for a sunny day of shopping at the beach. A classic print with a fresh silhouette that will be a show-stopping piece all summer long. 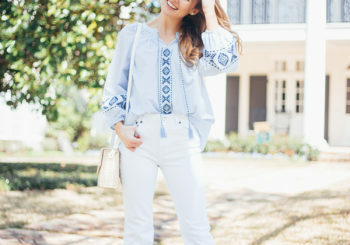 Love that top with white jeans! Would be cute with shorts too! I am so excited you shared the Sam Edelman Felicia flat. I have been looking for cute, affordable classic ballet flats and these fit the bill!! This top is so fun and has me craving summer!! Love the classic blue and white stripes!